Even with a ceremony capped by the unprecedented spectacle of the wrong producers accepting the evening’s biggest award before realizing something was wrong, the true winners at this year’s Oscars remain the brands that best used the glamourous brand of publicity that can only be found on Hollywood’s biggest night. According to social intelligence firm Talkwalker Inc., big-box-giant-turned-online-retail-upstart Wal-Mart Stores Inc. received the biggest boost of the night, with around 7000 mentions on social media and online between 7 PM ET and 6 AM the next morning. The New York Times, which prominently aired its first television ad during the Oscars, came in second, followed by Rolex, Cadillac, and tech giants Samsung Electronics Ltd. and Google Inc.
Talkwalker noted that Walmart’s victory was buoyed by the fact that the company sponsored the Oscar’s red carpet interviews. 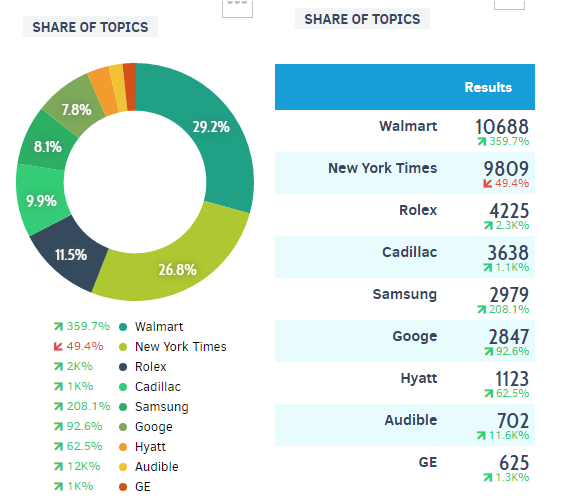 The top 10 brand mentions on Oscar night, courtesy Talkwalker. On the non-branded front Hollywood icon Warren Beatty, who found himself in the unenviable position of admitting that he and Bonnie and Clyde costar Faye Dunaway had mistakenly announced perceived frontrunner La La Land as this year’s Best Picture when it was actually low-budget coming-of-age drama Moonlight, received the highest number of mentions on social media – more than 200,000 – with these three tweets coming out on top. Finally, in a night that was lighter on anti-Trump material than many expected, host Jimmy Kimmel’s message to the U.S. president was by far the most retweeted message of the night, according to Twitter Inc.